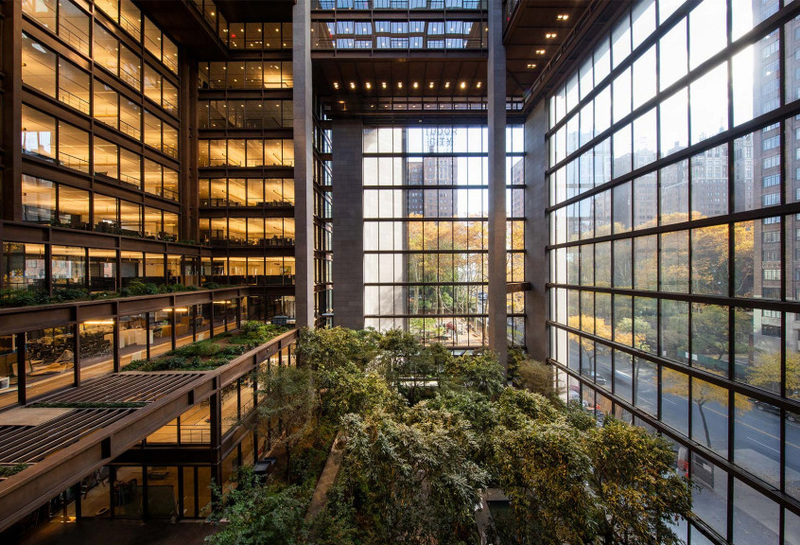 The redesigned New York City headquarters of the Ford Foundation features an indoor garden. 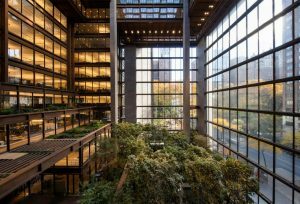 The New York City headquarters of the Ford Foundation has been transformed into the Ford Foundation Center for Social Justice. Led by Gensler, the major restoration project enhances the building’s original character, while increasing transparency and accessibility throughout the space. The renewal also brings the iconic building into alignment with the city’s safety code and New York City Landmarks Preservation Commission (LPC) requirements. The building is targeting the Leadership in Energy and Environmental Design (LEED) Platinum certification. A move to open workspaces has increased the amount of collaborative areas in the center and ensured views of the central atrium and garden are available on every floor. The building’s infrastructure, including mechanical, electrical, plumbing, sprinkler, and fire alarm systems, were brought up to code without sacrificing the structure’s aesthetics. Further, steel framing was restored in select locations to address 50 years of weathering. Additionally, Gensler implemented a full signage program, directory, and wayfinding strategy to reflect the building’s clean architecture. A portion of the concrete slab on the building’s second floor was also removed to create a double-height art gallery featuring 6-m (20-ft) ceilings and state-of-the art lighting.